I couldn’t decide if this went better in the “Eat More Fruits and Veggies” category, or the “Here are some great breakfast ideas for you” category. Because really, it fits into both. What a deal!! This is super simple to make and so, so yummy. Actually, it’s just delightful – which is why I just had to give it this cheesy name: “Fruit and Yogurt Delight.” I know, it sounds like something you’d get at the Mayberry Drug Store and share with Opie or something. Bet he’d think that’d be swell. But, take a look at this, and you tell me – does that not look delightful?! Mix yogurt, stevia or maple syrup and vanilla. 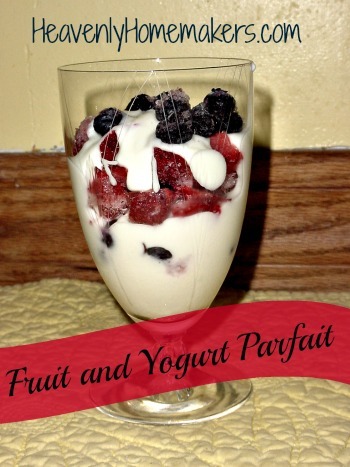 Layer yogurt and fruit in a dish, thus making it delightful to eat, and delightful to look at. I get so frustrated because SO MANY things in the store are advertised as being SO good for us but really it’s not (oh, don’t get me started). But one of my biggest frustrations is yogurt. It’s supposedly like the greatest health food according to almost everyone who says that it is. It’s full of high fructose corn syrup and artificial colors and artificial flavors. OR if it’s the “no sugar added” kind, it has fake junk in it to make it sweet. So, if you get the plain yogurt (or make your own) and add some yummy (and REAL) things to it, it’s just well, delightful! Go give this a try! Filed Under: Bread and Breakfast, Eat More Fruits and Veggies, Recipes, Side Dishes and Snacks, What's for breakfast? I totally agree with you! I now buy trader Joes yogurt which doesn’t have any junk stuff in it. It is sweetened with evaporated cane juice,and seems to be healthier than some other brands. A few months ago my hubby had to stay the night in the hospital for a heart issue. The next morning after telling us the kind of diet we should be on (though we are already eating healthy) they served him the most “un” healthy breakfast. I laughed. Needless to say all he ate was the fruit. I am with you on the yogurt! My mom thinks I’m too fussy because I don’t let her feed my kids unlimited quantities of artificially flavored and colored, HFCS-laden “healthy” yogurt at her house. They’re just as happy with plain yogurt mixed with unsweetened applesauce! Stonyfield Farms has healthy organic yogurt. My daughter won’t eat any other kind. I just started making my own yogurt and we love it! So easy! Homemade Yogurt is the best, while the rest of my Family were ALL getting sick, I stayed healthy no illness all last Winter! I’m having this for breakfast tomorrow. Another fun way to get some fruit in me. We make these in the canning jars. Just layer like you would in a bowl. My husband takes them for a quick snack or part of his lunch at work. In the evening just wash the jars out and refill! I’m new to your site, so maybe you’ve already covered this…you can make yogurt in your slowcooker! I first read about it on a blog, where she made a slow cooker recipe a day for a year. http://crockpot365.blogspot.com/2008/10/you-can-make-yogurt-in-your-crockpot.html We are a family of 8, so I use my 7 qt to use up a gallon milk in a big batch.